Eugene Kraemer; (his estate sale, Galerie Georges Petit, Paris, 5-6 May 1913, no. 1); Prince Giovannelli, Venice; Count Alessandro Contini Bonacossi [1878-1955], Florence and Rome; sold 1933 to the Samuel H. Kress Foundation, New York; gift 1939 to NGA. The Glory of Venice: Art in the Eighteenth Century, Royal Academy of Arts, London, and National Gallery of Art, Washington, 1994, 118, 445, no. 43 (repro. p. 118, color)(entry by Margherita Giacometti). Preliminary Catalogue of Paintings and Sculpture. National Gallery of Art, Washington, 1941: 37, no. 247, as Allegory of Painting. Book of Illustrations. National Gallery of Art, Washington, 1942: 244, repro. 83. Levey, Michael. Painting in XVIII Century Venice. Phaidon, London, 1959: 142, 145. Paintings and Sculpture from the Samuel H. Kress Collection. National Gallery of Art, Washington, 1959: 239, repro. Shapley, Fern Rusk. Paintings from the Samuel H. Kress Collection: Italian Schools, XVI-XVIII Century. London, 1973: 133, fig. 261. Shapley, Fern Rusk. Catalogue of the Italian Paintings. 2 vols. National Gallery of Art, Washington, 1979: I:125, II:pl. 86. Sani, Bernardina. 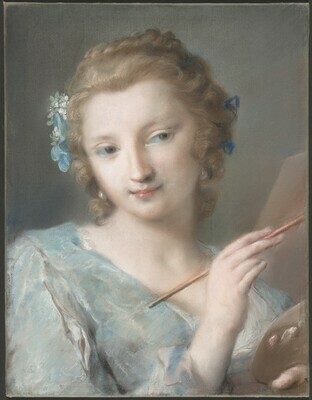 Rosalba Carriera. Allemandi, Turin, 1988: 301, fig. 168. Bailey, Martin. "Where Merchants were Kings." The Antique Collector 65/8 (1994): fig. 3. The Glory of Venice. Exh. cat. Royal Academy of Arts, London; National Gallery of Art, Washington; Museo del Settecento Veneziano - Ca'Rezzonico, Venice; Gallerie dell'Accademia, Venice, 1994-1995: 118, 445, no. 43. Bowron, Edgar Peters. "A Celebration of Eighteenth-Century Ventian Art." In sale catalogue for Theta Charity Antiques Show of Houston, Venice: The Masque of Italy, Sept. 17-20, 1998: 29-31, repro. Lavezzari, Paola. "Il 'bello' tra grafica e pittura: a proposito del pastello." In Per Luigi Grassi, Disegno e Disegni. Anna Forlani Tempesti and Simonetta Prosperi Valenti Rodinò, eds. Rimini, 1998: 469, 477, fig. 3. Minor, Vernon Hyde. Baroque & Rococo: Art and Culture. London, 1999: 242, fig. 6.22. Neil Jeffares. Dictionary of Pastellist before 1800. London, 2006: 109. Bernardina Sani. Rosalba Carriera, 1673 - 1757. Turin, 2008, no. 213.